Minnesota’s Capitol building in St. Paul. Clean energy advocates in Minnesota are concerned new legislation that could soon be signed by Gov. Mark Dayton will diminish regulatory oversight and reduce energy efficiency programs in rural Minnesota. Still, clean energy groups say the final bill might be considered a partial win because many of the provisions that could have negatively impacted the renewable energy sector were removed amid negotiations in the legislature. Fresh Energy, which publishes Midwest Energy News, considers the energy omnibus bill a setback. Republicans now hold a large majority in the Minnesota House and a one-vote advantage in the Senate. Dayton is a Democrat. Discussions over various energy provisions came at the close of the session, and the governor was forced to hold a special session to continue contentious negotiations. 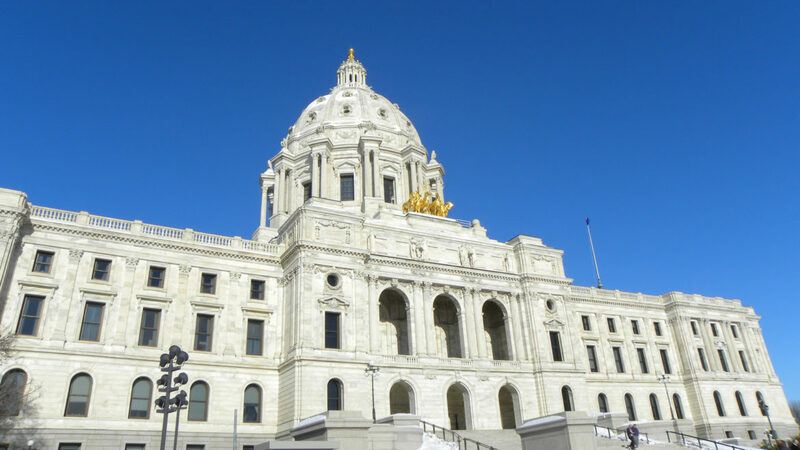 Groups against much of the legislation include the Citizens Utility Board of Minnesota, MN350, the Sierra Club, Take Action Minnesota, Minnesota Interfaith Power and Light, ISAIAH and the rural environmental and clean energy organization CURE. What did pass includes a plan to remove the Minnesota Public Utilities Commission from overseeing disputes between distributed generation customers and their electricity providers in rural communities. The commission had been looking into cases where rural clients who produced their own solar or wind power had been charged as much as $83 a month. Now, those cases will be heard by third-party mediators. Jim Horan, director of government affairs for the Minnesota Rural Electric Association, said the bill went through four rounds of compromise. The law simply clarifies “the role of local regulators” within Minnesota statutes regulating rural utilities, he said. The cost of the mediation will be paid for largely by utilities, Horan said, and reduce administrative time for both customers and regulators. “The compromise isn’t everything consumer-owned utilities wanted but it continues to be good policy for the state by reducing unnecessary administrative time and cost while supporting local democracy across Minnesota,” he said. The energy omnibus bill also exempts small utilities from the state’s Conservation Improvement Program. The change affects only cooperatives with fewer than 5,000 customers, of which there are 12 in Minnesota, and the 38 municipal utilities with fewer than 1,000 customers. A total of around 62,000 customers will be affected. The CIP requires electric and natural gas utilities to invest in programs that offer rebates for energy efficient appliances and encourages energy saving programs for both residential and commercial customers. Under state law, electric utilities have to invest at least 1.5 percent of their gross operating revenues in a CIP. “For all the talk around the Capitol about focusing on rural Minnesota, the energy bill specifically treats rural families and businesses as second-class citizens by removing their ability to save money through energy efficiency and investments in clean energy,” said Privratsky. Annie Levenson-Falk, executive director of the Minnesota Citizens Utility Board, said the demise of the CIP “will hurt utilities and consumers.” Greater efficiency brings down consumers’ bills and reduces potential power plant infrastructure costs borne by utilities, she said. Horan, who testified against the bill, said some of his rural members would like to see broader reform of the CIP, and believes other approaches could reduce carbon emissions and add efficiency to the grid. Elsewhere in the bill, a provision would charge electric-only vehicle owners $75 annually in an effort to recoup lost revenue from gas taxes. However, a Great Plains Institute report from earlier this year says electric vehicle owners pay substantially more taxes upfront than do drivers of gasoline-powered cars. The legislation also calls on the PUC to, in rate-making decisions, place a priority on having the state’s utility rates fall 5 percent below the national average. Minnesota’s rates are already below the national average, said Levenson-Falk, and utilities may bring forth other pressures, such as raising fixed charges or other fees — as has been done in other states — to bring in revenue instead of raising rates. Still, a number of provisions didn’t make it into the final legislation. A controversial proposal to have the legislature earmark $47 million in Volkswagen settlement fund money died. A sweeping proposal to have the state’s Renewable Development Fund directly managed by legislators was also rejected in favor of allowing them a more limited oversight role. Money from the fund, however, may be allocated to help two cities that will see the closure of biomass plants due to legislation ending a mandate that required two utilities to purchase power from them. Those communities could split $54 million in aid. Xcel Energy will be released from a mandate to buy electricity from a plant in Benson, as will Laurentian Energy Authority, which serves Hibbing and Virginia in northern Minnesota. Benson is expected to receive $20 million to $23 million in incentives to attract new industry to the plant, which employed 45 people, according to Minnesota Public Radio. Another 100 employees associated with Benson Power LLC may also lose their jobs due to the plant’s imminent shutdown. An attempt to require the PUC to make job retention a priority in decisions involving power plants was rebuffed, as was an effort to transform the agency by allowing political parties to appoint commissioners. The final legislation eliminated a provision removing the need for pipeline and large renewable energy project developers to file “certificate of need” documents with regulators. Levenson-Falk said that would have left Minnesotans “on the hook” for potentially expensive projects that had not been properly vetted. A residential version of the Property Assessed Clean Energy (PACE) financing program, which would allow homeowners to pay for energy improvement loans through their property taxes, was shelved in favor of future study, Levenson-Falk said. It’s a good move, she added, because CUB and other advocates want to see consumer protections built into future PACE residential bills. CUB and others want a residential PACE program but with more safeguards, she said. Clean energy and environmental advocates are concerned that several provisions in a Minnesota Jobs and Energy Omnibus bill would remove regulatory oversight of programs, shift power from experts to legislators and potentially kills jobs in a growing sector.